Big fan of virtually all SS's London establishments, but a bad experience 3/4 years ago put this one off the radar - we (2) decided to try again on 16/01/16 fairly near the start of a SS Crawl. Pitching up at around 9pm, the lights were on inside but the doors were locked, a polite knock at the door brought a surly young lady, who when another group of 3 who had arrived behind us asked whether they were open, rudely asked if it looked like it! Well yes it sort of did, and if not then why not? Firmly off the list, for good this time! After a pint at the beautiful Angel in the Fields I decided to visit more Sam Smith's venues in the neighbourhood to see if they matched up. 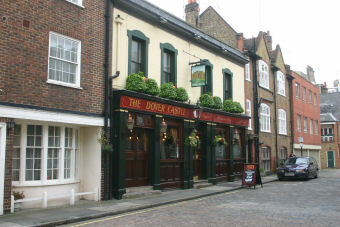 The Dover Castle was not as visually striking, but had a place of its own on the podium of pub glory for its sense of serenity. There were few in at around 4pm on a Saturday, but there was just enough of a burble to remind you that it was a pub & not a church, as some Sam Smith's places strike me. A pint of OBB as usual, 2.90 as usual, and a pleasant half hour.